I am using Lato (a Google font) for body copy and most headlines. However, I'd like to add two Typekit fonts for very occasional use in callouts on my site. It looks to me like you have a choice of either Google or Typekit but not both. Is there any way to use both? I didn't realize this would be so hard. You can use both the font, Adobe Type Kit and Google font. For that, you have to create different font template. Like you have created Body copy and Heading create another font and assign Adobe Type kit font. After that you can now use the template to any place. I am sure you know how to add Adobe Type kit font? if not please check this article. Well, I thought I had this all figured out. I went through all the steps, got the Typekit Extension activated, and it correctly shows the Typekit font. But when I select the dropdown in the Font manager, all it shows are the system fonts and Google fonts. I have activated the Typekit Extension, and I have cleared my cache over and over (I have WP Rocket). I also tried disabling the Typekit font, clearing cache, and then enabling it again. 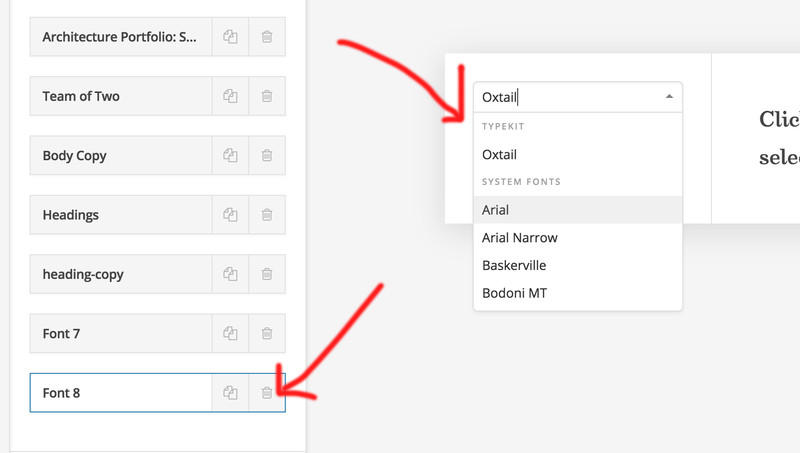 You don't need to use the Typekit Extension and it also does not connect to the Font Manager. Please uninstall it and follow the setup here. Yes, that worked. The first time I asked the question (above) I was told to install the TypeKit Extension. This was a much better solution. Thank you very much!